In Part Seven we looked at some early GCM work – late 80’s to mid 90’s. In Part Eight we looked at some papers from the “Noughties” – atmospheric GCMs with prescribed ocean temperatures and some intermediate complexity models. All of these papers were attempting to do the most fundamental of ice age inception – perennial snow cover at high latitudes. Perennial snow cover may lead to permanent ice sheets – but it may not. This requires an ice sheet model which handles the complexities of how ice sheets grow, collapse, slide and transfer heat. Given the computational limitations of models even running a model to produce (or not) the basics of perennial snow cover has not been a trivial exercise, but a full atmospheric ocean GCM with an ice sheet model run for 130,000 years was not a possibility. In this article we will look at a very recent paper, where fully coupled GCMs are used. “Fully coupled” means an atmospheric model and an ocean model working in tandem – transferring heat, moisture and momentum. It is generally accepted that the timing of glacials is linked to variations in solar insolation that result from the Earth’s orbit around the sun (Hays et al. 1976; Huybers and Wunsch 2005). These solar radiative anomalies must have been amplified by feedback processes within the climate system, including changes in atmospheric greenhouse gas (GHG) concentrations (Archer et al. 2000) and ice-sheet growth (Clark et al. 1999), and whilst hypotheses abound as to the details of these feedbacks, none is without its detractors and we cannot yet claim to know how the Earth system produced the climate we see recorded in numerous proxy records. This is of more than purely intellectual interest: a full understanding of the carbon cycle during a glacial cycle, or the details of how regional sea-level changed as the ice-sheets waxed and waned would be of great use in accurately predicting the future climatic effects of anthropogenic CO2 emissions, as we might expect many of the same fundamental feedbacks to be at play in both scenarios.. ..The multi-millennial timescales involved in modelling even a single glacial cycle present an enormous challenge to comprehensive Earth system models based on coupled atmosphere–ocean general circulation models (AOGCMs). Due to the computational expense involved, AOGCMs are usually limited to runs of a few hundred years at most, and their use in paleoclimate studies has generally been through short, ‘‘snapshot’’ runs of specific periods of interest. Transient simulations of glacial cycles have hitherto only been run with models where important climate processes such as clouds or atmospheric moisture transports are more crudely parameterised than in an AOGCM or omitted entirely. The heavy restrictions on the feedbacks involved in such models limit what we can learn of the evolution of the climate from them, particularly in paleoclimate states that may be significantly different from the better-known modern climates which the models are formulated to reproduce. Simulating past climate states in AOGCMs and comparing the results to climate reconstructions based on proxies also allows us to test the models’ sensitivities to climate forcings and build confidence in their predictions of future climate. [Emphasis added. And likewise for all bold text in future citations]. For these simulations we use FAMOUS (FAst Met. Office and UK universities Simulator), a low resolution version of the Hadley Centre Coupled Model (HadCM3) AOGCM. FAMOUS has approximately half the spatial resolution of HadCM3, which reduces the computational cost of the model by a factor of 10. 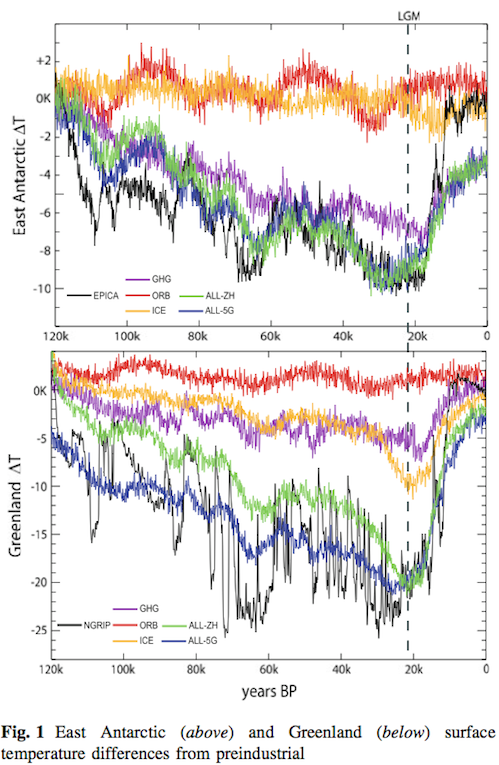 Here we present the first AOGCM transient simulations of the whole of the last glacial cycle. We have reduced the computational expense of these simulations by using FAMOUS, an AOGCM with a relatively low spatial resolution, and by accelerating the boundary conditions that we apply by a factor of ten, such that the 120,000 year cycle occurs in 12,000 years. We investigate how the influences of orbital variations in solar irradiance, GHGs and northern hemisphere ice-sheets combine to affect the evolution of the climate. There is a problem with the speeding up process – the oceans respond on completely different timescales from the atmosphere. Some ocean processes take place over thousands of years, so whether or not the acceleration approach produces a real climate is open to discussion. The aim of this study is to investigate the physical climate of the atmosphere and ocean through the last glacial cycle. Along with changes in solar insolation that result from variations in the Earth’s orbit around the sun, we treat northern hemisphere ice-sheets and changes in the GHG composition of the atmosphere as external forcing factors of the climate system which we specify as boundary conditions, either alone or in combination. Changes in solar activity, Antarctic ice, surface vegetation, or sea- level and meltwater fluxes implied by the evolving ice- sheets are not included in these simulations. Our experimental setup is thus somewhat simplified, with certain potential climate feedbacks excluded. Although partly a matter of necessity due to missing or poorly modelled processes in this version of FAMOUS, this simplification allows us to more clearly see the influence of the specified forcings, as well as ensuring that the simulations stay close to the real climate. Lots of interesting things to note here. When we look at Antarctica we see that orbital forcing alone and Northern hemisphere ice sheets alone do little or nothing to model past temperatures. But GHG concentrations by themselves as a forcing provide a modeled temperature that is broadly similar to the last 120kyrs – apart from higher frequency temperature variations, something we return to later. When we add the NH ice sheets we get an even better match. I’m surprised that the ice sheets don’t have more impact given that amount of solar radiation they reflect. Both GHGs and ice sheets can be seen as positive feedbacks in reality (although in this model they are specified), and for the southern polar region GHGs have a much bigger effect. Looking at Greenland, we see that orbital forcing once again has little effect on its own, while GHGs and ice sheets alone have similar effects but individually are a long way off the actual climate. Combining into all forcings, we see a reasonable match with actual temperatures with one sheet reconstruction and not so great a match for the other. This implies – for other models that try to model dynamic ice sheets (rather than specify) the accuracy may be critical for modeling success. We again see that higher frequency temperature variations are not modeled at all well, and even some lower frequency variations – for example the period from 110 kyr to 85 kyr has some important missing variability (in the model). The EPICA data [Antarctica] shows that, relative to their respective longer term trends, temperature fell more rapidly than CO2 during this period [120 – 110 kyrs], but in our experiments simulated Antarctic temperatures drop in line with CO2. This suggests that there is an important missing feedback in our model, or that our model is perhaps over-sensitive to CO2, and under-sensitive to one of the other forcing factors. Tests of the model where the forcings were not artificially accelerated rule out the possibility of the acceleration being a factor. What about the higher frequency temperature signals? The Greenland data has a much larger magnitude than Antarctica for this frequency, but neither are really reproduced in the model. The other striking difference between the model and the NGRIP reconstruction is the model’s lack of the abrupt, millennial scale events of large amplitude in the ice-core data. It is thought that periodic surges of meltwater from the northern hemisphere ice-sheets and subsequent disruption of oceanic heat transports are involved in these events (Bond et al. 1993; Blunier et al. 1998), and the lack of ice-sheet meltwater runoff in our model is probably a large part of the reason why we do not simulate them. Taken together, the lack of both millennial scale warm events in the south and abrupt events in the north strongly imply a missing feedback of some importance in our model. The processes by which sufficient quantities of carbon are drawn down into the glacial ocean to produce the atmospheric CO2 concentrations seen in ice-core records are not well understood, and have to date not been successfully modelled by a realistic coupled model. FAMOUS, as used in this study, does have a simple marine biogeochemistry model, although it does not respond to the forcings in these simulations in a way that would imply an increased uptake of carbon. A further FAMOUS simulation with interactive atmospheric CO2 did not produce any significant changes in atmospheric CO2 during the early glacial when forced with orbital variations and a growing northern hemisphere ice-sheet. Accurately modelling a glacial cycle with interactive carbon chemistry requires a significant increase in our understanding of the processes involved, not simply the inclusion of a little extra complexity to the current model. This is a very interesting paper, highlighting some successes, computational limitations, poorly understand feedbacks and missing feedbacks in climate models. The fact that 120 kyrs of climate history has been simulated with a full GCM is great to see. The lack of abrupt climate change in the simulation, the failure to track the fast rate of temperature fall at the start of ice age inception and the lack of ability to model key feedbacks all indicate that climate models – at least as far as the ice ages are concerned – are at a rudimentary stage. (This doesn’t mean they aren’t hugely sophisticated, it just means climate is a little bit tricky). The ocean component is based on the rigid-lid Cox-Bryan model (Pacanowski et al. 1990), and is run at a resolution of 2.5° latitude by 3.75° longitude, with 20 vertical levels. The atmosphere is based on the primitive equations, with a resolution of 5° latitude by 7.5° longitude with 11 vertical levels (see Table 1). Version XDBUA of FAMOUS (simply FAMOUS hereafter, see Smith et al. (2008) for full details) has a preindustrial control climate that is reasonably similar to that of HadCM3, although FAMOUS has a high latitude cold bias in the northern hemisphere during winter of about 5°C with respect to HadCM3 (averaged north of 40°N), and a consequent overestimate of winter sea-ice extent in the North Atlantic. The global climate sensitivity of FAMOUS to increases in atmospheric CO2 is, however, similar to that of HadCM3. FAMOUS incorporates a number of differences from HadCM3 intended to improve its climate simulation—for example, Iceland has been removed (Jones 2003) to encourage more northward ocean heat transport in the Atlantic. Smith and Gregory (2009) demonstrate that the sensitivity of the Atlantic meridional overturning circulation (AMOC) to perturbations in this version of FAMOUS is in the middle of the range when compared to many other coupled climate models. The model used in this study differs from XDBUA FAMOUS in that two technical bugs in the code have been fixed. Latent and sensible heat fluxes from the ocean were mistakenly interchanged in part of the coupling routine, and snow falling on sea-ice at coastal points was lost from the model. Correction of these errors results in an additional surface cold bias of a degree or so around high latitude coastal areas with respect to XDBUA, but no major changes to the model climatology. In addition, the basic land topography used in these runs was interpolated from the modern values in the ICE-5G dataset (Peltier 2004), which differs somewhat from the US Navy-derived topography used in Smith et al. (2008) and HadCM3. IMO, this is a really interesting, detailed post. I really dig it. Thanks. Almost no change in global Albedo then. Despite all that extra continental glacier and sea ice and desert/grassland/tundra and decline in forested areas which reflects a huge amount of solar energy compared to interglacial conditions. Cloud Albedo is also supposed to go up as temperatures decline – an extra -0.75 W/m2/K. Its impossible to model the last glacial timeline when the ice-albedo and land-surface-albedo forcing and cloud albedo forcing is downplayed so much compared to what must have actually happened. I expect there is a significant change in global albedo in the model, but other factors act as negative feedbacks. In the next article we will see a paper which breaks out the various positive and negative feedbacks found in their model (attempting to produce perennial snow cover at 115kyrs). What is fascinating is that the amplification of the lower insolation in summer at high latitudes is amplified by snow/ice albedo and then reduced by other factors. It is remarkable just how small the orbital forcing term is and how uncorrelated it is to the 100,000y glacial cycle. The main signal is the 41,000 y change in orbital tilt which does show up as a perturbation in the temperature data. The orbital forcing also seems to be larger over the southern hemisphere rather than the northern hemisphere. You would expect the ice albedo feedback to orbital forcing to be much larger in the northern hemisphere but this is not actually modelled, and instead is an input parameter. The change in ice albedo apparently has no effect whatsoever in Antarctica. I wonder if that also applies to the tropics and S. hemisphere? This seems strange to me. There should be an effect on MOC heat transfer through the oceans and for example the position of jet streams. In the end the model relies on CO2 forcing (taken as an input) to get a reasonable fit. However we know that the CO2 curve is taken from same the Ice core temperature data, so it is not surprising that the model can follows the 100y cycle. HADCM3 also has one of the highest CO2 sensitivities in CMIP5. It also seems likelt that 5-G simply has an ice extent distribution which is tuned to agree with the Greenland temperature data. Still this is a valiant attempt to use a GCM to model the last glacial cycle and the authors are to be applauded for trying. I still have the feeling though that we are still missing something fundamental to properly explain ice ages. In a sense we might perhaps say that the calculation tells on a rough consistency of the calculated temperatures with those inferred from proxies, when other major factors are forced to their ice age values, rather than presents an explanation of ice ages. That’s certainly better than nothing, but something very essential is still missing. In another paper we will see how insolation variation appears to have such a dominance, to the point I have emailed the lead author with a request to explain it. A thought. As temperature decreases, could ocean current changes occur at some point that may increase nutrient up-welling, thus resulting in greatly increase ocean plant life over large areas, thus reducing atmospheric CO2? I used to think this was a simple question that I hadn’t got around to delving into. Now I believe it is one of the many major questions in understanding the ice ages. Due to its importance I am sure we will review the theories and evidence later in this series. Insolation-driven 100,000-year glacial cycles and hysteresis of ice-sheet volume, Ayako Abe-Ouchi et al. doi:10.1038/nature12374 (Maureen Raymo is one of the authors). They have a model whereby as the N. American glacier grows it eventually extends too far south for it’s own stability and then rapidly collapses during the next warm spell caused by orbital forcing. Once melting starts it rapidly collapses within a few thousand years ending an ice age. The growth and reduction of Northern Hemisphere ice sheets over the past million years is dominated by an approximately 100,000-year periodicity and a sawtooth pattern1, 2 (gradual growth and fast termination). Milankovitch theory proposes that summer insolation at high northern latitudes drives the glacial cycles3, and statistical tests have demonstrated that the glacial cycles are indeed linked to eccentricity, obliquity and precession cycles4, 5. Yet insolation alone cannot explain the strong 100,000-year cycle, suggesting that internal climatic feedbacks may also be at work4, 5, 6, 7. Earlier conceptual models, for example, showed that glacial terminations are associated with the build-up of Northern Hemisphere ‘excess ice’5, 8, 9, 10, but the physical mechanisms underpinning the 100,000-year cycle remain unclear. Here we show, using comprehensive climate and ice-sheet models, that insolation and internal feedbacks between the climate, the ice sheets and the lithosphere–asthenosphere system explain the 100,000-year periodicity. The responses of equilibrium states of ice sheets to summer insolation show hysteresis11, 12, 13, with the shape and position of the hysteresis loop playing a key part in determining the periodicities of glacial cycles. The hysteresis loop of the North American ice sheet is such that after inception of the ice sheet, its mass balance remains mostly positive through several precession cycles, whose amplitudes decrease towards an eccentricity minimum. The larger the ice sheet grows and extends towards lower latitudes, the smaller is the insolation required to make the mass balance negative. Therefore, once a large ice sheet is established, a moderate increase in insolation is sufficient to trigger a negative mass balance, leading to an almost complete retreat of the ice sheet within several thousand years. This fast retreat is governed mainly by rapid ablation due to the lowered surface elevation resulting from delayed isostatic rebound14, 15, 16, which is the lithosphere–asthenosphere response. Carbon dioxide is involved, but is not determinative, in the evolution of the 100,000-year glacial cycles. The modelling results reported by Abe-Ouchi et al. in this issue may provide a solution to these problems. Through asynchronous coupling of sophisticated climate and ice-sheet models, Abe-Ouchi and co-authors make a convincing case that the geometry of North America and the long response time of isostatic compensation — the change in height of Earth’s surface in response to ice-sheet formation and retreat —are the main agents that transform 19,000-year (19-kyr), 23-kyr and 41-kyr orbital variations into a 100-kyr Earth-system response. However, some lingering mysteries remain, such as the effects of the oversimplified treatment (or absence) of ice sheet–ocean interactions, basal flow (ice-sheet sliding and subglacial sediment deformation) and ice-stream processes in the authors’ simulations. Furthermore, ice-sheet melt rates are estimated only from air temperature, and are not based on energy-balance physics within the atmospheric model used by the authors. As climate and ice-sheet models become more sophisticated, we will see further refinement of these results. Moreover, Abe-Ouchi and colleagues’ findings do not explain the transition that took place 900,000 years ago, when the world moved from 41-kyr to 100-kyr glacial cycles. Isostatic time scales and North American geography did not change across this boundary, so another factor must have been at work. There are some layers yet to be explored in the mysteries of the ice age. My first reaction is that the density of ice is much lower than the density of the Earth crust and mantle. Thus added ice should always lead to a surface at higher altitude even after the deformation of the crust and mantle is complete. The dynamics may lead to an initial ice sheet that reaches a higher altitude than is maintained under later conditions, but many factors must cooperate to make this explanation work. In particular the gradual lowering of the surface under the pressure of ice must not be compensated by formation of more ice. The issues mentioned by Shawn Marshall in his last paragraph seem to be essential for deciding whether the overall picture of Abo-Ouchi et al may be correct. Those without access to Nature can get some idea of the work from the video and supplementary information linked to at the bottom of this page. In the quote from Marshall where he says “Moreover, Abe-Ouchi and colleagues’ findings do not explain the transition that took place 900,000 years ago, when the world moved from 41-kyr to 100-kyr glacial cycles” I wonder if a periodic or other forcing is needed to explain some of these variations or whether a dynamical argument in the spirit of A. M. Hogg, GRL, VOL. 35, L01701, doi:10.1029/2007GL032071, 2008, “Glacial cycles and carbon dioxide: A conceptual model”, suffices? Glacial – inter-glacial oscillations in our model occur owing to the combination of ice albedo and a variant of the precipitation-temperature feedback.. ..In spite of much progress, it is probably fair to state that the source of the dominant 100-kyr timescale, the typical asymmetric sawtooth pattern of glacial- interglacial climatic variability, and the mechanism of observed rapid climate transitions still lack a satisfactory detailed physical mechanism. 1. It’s fairly easy to come up with systems that oscillate in and out of ice ages, with parameters that are in the bounds of reasonable physics/chemistry/biology. 2. In the cases like Hogg 2008 where the “initial perturbation/forcing” is orbital changes, given that we are talking of very small changes, why doesn’t the paper evaluate the impact of the much larger “naturally occurring” climate changes we see in the proxy record? In Hogg 2008 the temperature variation induced by eccentricity is given as 0.1’C. What happens when you impose a 1’C or 2’C century-long perturbation into one of these systems? What happens when you impose a 1′C or 2′C century-long perturbation into one of these systems? I would say that it would depend a lot on where you were in the cycle and the direction of the perturbation. The Eemian interglacial, by the ice-core and sea level record, was warmer than this one at its peak. Yet it still didn’t last. The interesting question is not how glacial periods start, it’s why interglacial periods don’t last very long compared to glacial periods. The sawtooth pattern of the temperature record strongly indicates, to me at least, that warm periods just aren’t stable with the current planetary geography. The fact that GCM’s don’t simulate this well is most likely a problem with the GCM’s and our understanding of how the climate of the planet actually functions. Just to clarify, the models of Hogg, Salzman and (unreferenced) by Walsh, McGehee, and Widiasih are *not* GCMs. They are much simpler models described as coupled *dynamical* *systems*. Their simplicity is intended to help convey understanding. While, technically, GCMs might also be dynamical systems, they are intended to be as faithful as possible to climatology, whereas these are intended to explore the space of possible climates and interrelationships among parameters. I exp[lain this because an audience may not be able to follow this from what’s been written here. From the perspective of a dynamicist, “how the climate of a planet actually functions” is of less importance than understanding the space of *all* possible climate futures from a given starting point in a state space. Now, surely, this may help improve mechanics of GCMs at some point, because simplifications may be possible, but it is not the primary purpose of Hogg-like simple conceptual models. The limiting factor in most GCMs is the resolution of the grid they are run upon. That relates directly to available computing power, and, while these are run on some very big systems, the biggest systems have not yet been applied to the problem. Limited applications of the biggest ones, typically those used for nuclear weapons engineering, to climate-related problems like melt-back of glacier calving surfaces has shown far better fidelity with observation than the coarser models. So there’s a lot of hope there. OK, bad terminology. But I believe my point is still valid. The underlying assumption of whatever you call the models being used is that the warm interglacial climate is stable unless forced to cool somehow. I don’t see how you can look at the various proxy records for the last few million years or the Vostok ice core record and draw that conclusion. The current base state is glacial and has in the past always decayed back to that state after transient excursions into interglacial conditions. Since the separation of Antarctica from South America and more recently the closure of the Isthmus of Panama, the Atlantic Ocean has been acting as a giant heat pump cooling the planet. I sympathize with Ruddiman’s view that the only reason that the planet hasn’t already started to descend back into glacial conditions is that humans have altered the climate starting with the invention of large scale agriculture. Should add, now that I have the “space”, that dynamicists explore state spaces for features like bifurcations which, while they are very interesting from an understanding an academic perspective, may well be more important from a practical perspective, given the dramatic changes in climate they imply. Still, this is a centuries-long process and, to the degree we can’t get policymakers or public to care much about 2100, worrying about 2200+, even if they should, seems to be just unhappiness incarnate. I’m sure there’s lots more – generally systems with positive feedbacks but some overall constraints do this quite easily. Another non-physics example, but relevant for climate, occurs in the biological space with predators vs predatee (invented word for the “to be eaten” species). GCMs generally seem to have more trouble re-creating bifurcations that are found in simple systems and intermediate complexity systems (like EMICs), but it’s a subject I have little understanding of. All kind of complex dynamics requires that there’s is not too much dissipation relative to other dynamical factors and memory at spatial and temporal scales relevant to the particular form of dynamics being considered. It’s conceivable that present GCMs have so much effective dissipation on the relevant scales that their dynamics becomes too much a combination of changes driven by forcings and noise. That may be true both for the phenomena that control glacial cycles and for multidecadal oscillations. At the same time they may contain red noise that causes variability in the results at a level that may look superficially similar to the dynamics of the real Earth system, but based on totally wrong dynamic couplings. @DeWittt, regarding “I sympathize with Ruddiman’s view that the only reason that the planet hasn’t already started to descend back into glacial conditions is that humans have altered the climate starting with the invention of large scale agriculture.” I also am sympathetic with that view, now having read Ruddiman and your comment, but I just don’t know where the line was crossed or where we otherwise would have dipped into a glacial without the forcing. Ruddiman’s hypothesis led naturally to the immediate criticism that the human population was too low for supporting releases necessary for the hypothesis. Joos has been studying carbon cycle for long and is also the first author of the review article used heavily by IPCC AR5. He was one of the early critics. Another interesting paper that considers Ruddiman’s hypothesis highly suspect at least for CO2 is a lengthier 2006 text by Olofsson. Ruddiman has defended his work in this 2009 paper.. The discrepancies between the estimates are large. Intuitively it’s much easier for me to think that Ruddiman’s hypothesis cannot be correct, but I haven’t looked carefully on much of this material. Since the IPCC AR4, the mechanisms underlying the observed 20 ppm CO2 increase between 7 ka and the Industrial Era have been a matter of intensive debate. During three interglacial periods prior to the Holocene, CO2 did not increase, and this led to a hypothesis that pre-industrial anthropogenic CO2 emissions could be associated with early land use change and forest clearing (Ruddiman, 2003, 2007). However, ice core CO2 data (Siegenthaler et al., 2005b) indicate that during Marine Isotope Stage 11 (see Chapter 5, Section 5.2.2), an interglacial period that lasted from 400 to 420 ka, CO2 increased similarly to the Holocene period. Drivers of atmospheric CO2 changes during the Holocene can be divided into oceanic and terrestrial processes (Figure 6.5) and their roles are examined below. Some recent studies focused on reconstructing LULCC and making very simple assumptions regarding the effect of land use on carbon (Olofsson and Hickler, 2008; Lemmen, 2009). Other studies relied on more sophisticated terrestrial biosphere models to simulate carbon storage and loss in response to pre-industrial LULCC during the late Holocene (Strassmann et al., 2008; Pongratz et al., 2009; Stocker et al., 2011). The conclusion of the above studies was that cumulative Holocene carbon emissions as a result of pre-industrial LULCC were not large enough (~50–150 PgC during the Holocene before 1850) to have had an influence larger than an increase of ~10 ppm on late Holocene observed CO2 concentration increase (Figure 6.5). However, a modelling study by Kaplan et al. (2011) suggested that more than 350 PgC could have been released as a result of LULCC between 8 ka and 1850 as a result of a much stronger loss of soil carbon in response to land use change, than in other studies. My reading of Ruddiman is not that humans caused CO2 and CH4 to increase a lot, it’s that they should have decreased based on the pattern from previous interglacials, and in fact were decreasing from their peaks until ~6.000 ya. See Figure 6 here. Also, Ruddiman does not include any possible contribution from slash and burn agriculture. According to Ruddiman CO2 concentration increased by about 20 ppm over the 8000 years to 1800, but would have declined by almost 20 ppm without the human contribution. Joos estimated that such an effect would have required a release of about 700 GtC over that period taking into account the natural uptake over such a long period. Kaplan et al give an estimate that could support Ruddiman – and Ruddiman is one of the coauthors of that study. if the uptake mechanisms are in addition weaker than the present best estimates indicate. AR5 and the 2013 background review paper by Joos et al tell about large remaining uncertainties in the uptake of CO2. The paper of Kaplan et al is in a special issue (August 2011, Vol 21, No 5, Holocene Special Issue: The early-Anthropocene hypothesis Edited by: William F. Ruddiman, Michael C. Crucifix and Frank A. Oldfield) of the Journal The Holocene. Ruddiman is the first name on the list of editors of that issue. Concentrations of CO2 and CH4 in the atmosphere rose slowly during the millennia prior to the industrial era. Opposing explanations for these increases have invoked natural and anthropogenic sources. Here we revisit this argument using new evidence to see whether either explanation can be falsified (disproven, in the sense proposed by German philosopher Karl Popper). Two lines of evidence suggest that natural explanations for the CH4 increase are falsified: (1) the absence of any sustained methane increase early in seven interglaciations prior to the Holocene; and (2) weakening emissions during the last 5000 years from the two largest global sources of CH4 – north tropical and boreal wetlands. Consistent with this interpretation, a new synthesis of archeological data from southern Asia reported in this issue indicates an exponential increase in CH4 emissions from expanding rice irrigation during the last 5000 years. Neither the anthropogenic nor the natural explanations for the CO2 increase can at this point be falsified. Previous studies that rejected the early anthropogenic hypothesis based on the small size of early farming populations ignored a rich array of archeological and historical evidence showing that early farmers used much more land per capita than those in the centuries just before the industrial era. Previous interpretations of very small terrestrial (anthropogenic and other) carbon emissions during the last 7000 years based on the d13CO2 record failed to incorporate credible estimates of very large carbon burial in boreal peat lands during the late Holocene. Allowance for larger burial in peat deposits requires much greater emissions of anthropogenic carbon to balance the d13CO2 budget. The prevalence of downward CO2 trends during equivalent intervals early in previous interglaciations poses a major problem for natural explanations of the late-Holocene CO2 increase. I haven’t looked in more detail in these articles, but my impression is still that most scientists are highly skeptic on Ruddiman’s hypothesis, while it cannot be definitely dismissed. in light of the very recent paper on models vs. reality and clouds, could the glacial climates in reality make more clouds outside the ice sheet areas thus keeping the rest of the surface a bit warmer? the insolation is presumed to be constant so it would steepen the slope from tropics to the edge of the ice sheet, have I got this wrong somehow? The interesting question is not how glacial periods start, it’s why interglacial periods don’t last very long compared to glacial periods. The sawtooth pattern of the temperature record strongly indicates, to me at least, that warm periods just aren’t stable with the current planetary geography. This is an interesting hypothesis, and following it we might then expect that the local impact of lower insolation at higher latitudes to be a factor that can perturb the climate out of its unstable state into its stable state. In which case, the even more difficult question becomes – how is it possible for local higher insolation at high latitudes to push the climate out of its very stable ice age state into an inter-glacial? And the additional factor to consider is the amount of solar radiation now reflected at the Last Glacial Maximum due to the large ice sheets covering significant land areas. There are more questions related to the climate during the last ice age, and why the last ice age ended when it did, which we will see in future articles. Obviously there is another mechanism in play that is not being modeled. The Roe paper shows that the rate of ice volume change appears to track high latitude insolation changes except at glacial to interglacial transition. Then the reduction and following increase in ice volume is much larger than modeled by orbital changes alone. The obvious suspect would be CO2. You need some sort of CO2 storage mechanism that becomes less stable over time so that it can be triggered to begin release by a relatively small change in temperature, such as a Dansgaard-Oeschger event, and amplify it. Once the reservoir empties, atmospheric CO2 removal starts again and the climate cools without having to invoke changes in insolation at high latitudes. That likely helps too, but it’s not at all clear that it’s the primary driver. I haven’t done it, but I’ll be surprised if when you plot ice core CO2 and temperature vs time, you don’t find that CO2 changes much less with temperature during D-O events during the glacial period than at the glacial to interglacial transition. Less likely, IMO, is some variation on Richard Muller’s orbital plane dust theory. The Roe paper is interesting, the problem with assessing it is the low resolution graphic that compresses the last 100kyrs into something that is hard to make out – it looks like some critical periods are out of phase rather than in phase. Also I don’t know how the HW04 series stacks up against recent developments in dating from EPICA. In fact, assessing the graphs in most ice age papers is a problem. Jonathon Levine told me that was actually the reason he wrote his Matlab program – so he could produce his own high resolution time series and evaluate all these different theories, instead of trying to use a ruler on a small graphic that covers 800k years. I have tried to reproduce the Roe result. The graph linked below shows my calculation of insolation at the North Pole plotted together with the rate of change of ice volume. More summer insolation clearly melts more ice – That is the conclusion. The cause of the 100,000y cycle remains unexplained. The problem with Muller’s theory is that the change in inclination of the Earth’s orbit to the solar ecliptic plane does not correlate with Ice Ages. However the change in ellipticity does correlate. I then went looking for evidence in the TSI data but I couldn’t find significant evidence of significant dust clouds in the data. However I did find a beautiful lunar signal in the data. The moon-earth system orbits the C.of mass 4000km outside the Earth’s core. 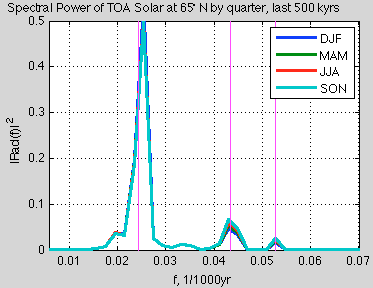 This causes a monthly oscillation in the Earth-Sun distance which shows up in TSI. I have another question about the Roe paper, that’s been bubbling away at the back of my mind. If the relationship is so strong between summer insolation 65’N and d(Ice volume)/dt then why in the proxy record does the 100kyr time period show up strongly (when analyzed in the frequency domain)? This period doesn’t show up in the 65’N insolation. That’s an extremely good question. It’s exactly why Muller proposed his dust hypothesis. As I pointed out above, though, dV/dt α S_65N(t) appears to hold only between the major transitions. Something else is going on. Until we know what that is, it’s not at all clear that a reliable model can be constructed and that results from current models may not even be particularly instructive. A sudden change in a quasi-periodic oscillation frequency can be expected from a system that exhibits long term persistence. The trigger in that case can be very small. It can, in fact, be just noise. However, it’s likely, IMO, that the dissipation built in to current climate models is so high that even if you could run them long enough, it’s not clear that they would exhibit spectral power distributions that in any way mimic the real climate at very low frequencies. And that’s not to mention the massively different time scales of the oceans and the atmosphere. I’m afraid that, like string theory in Physics, a lot of people are spending a lot of time and money on a dead end. What data source did you use for ice volume? Sorry – the source is LR04 – 57 globally distributed benthic d18O records. 1) Strong enough insolation at North Pole leads always to a large drop in ice volume (unless the volume is already near the minimum level). 2) The ice volume grows steadily in absence of high insolation maximum up to a level where a weaker insolation maximum is enough to turn the volume to rapid decline. In this case some kind of state shift is involved as the decline from a high value ends always with a very low volume. – initial rapid growth of volume after the deep minimum. Minor point in your dust cloud post, it’s 3He that’s correlated with cosmic dust. 3H (not H3) or tritium isn’t stable and has a half life of 12.32 years. I don’t think you can use δ18O from benthic foraminifera directly as a proxy for ice volume either. See this reference, for example. Thanks – Yes indeed it should have been 3He – sorry for typo. I agree that δ18O are not a direct proxy for ice volume but they display the same dependence as ice core from Greenland and Antarctica. They also demonstrate that glacial cycles were global effects. So that data is from A Pliocene-Pleistocene stack of 57 globally distributed benthic D18O records, Lorraine E. Lisiecki & Maureen E. Raymo (2005)? This paper’s approach, along with most proxy dating, doesn’t have a dating mechanism, so takes as the best starting point that the peaks and troughs are aligned with insolation curves from high latitude. That said, I’m still at a beginner stage with the historical records so there might be some independent verification that makes it justified. I just downloaded the NGRIP data which is ice core data from N. Greenland and goes back to 123kyrs – the advantage there is that firstly individual years can be seen in the record, secondly when individual years can no longer be detected the length vs age relationship is constrained by some fairly basic physics. We also present a new LR04 age model for the Pliocene-Pleistocene derived from tuning the d18O stack to a simple ice model based on 21 June insolation at 65°N. Stacked sedimentation rates provide additional age model constraints to prevent overtuning. Despite a conservative tuning strategy, the LR04 benthic stack exhibits significant coherency with insolation in the obliquity band throughout the entire 5.3 Myr and in the precession band for more than half of the record. I’m sure it’s clear why the coherence of the insolation at high latitudes with a proxy record tuned to the insolation at high latitudes will be higher than the coherence of insolation with the actual record. So it’s necessary to get a better understanding of the data sources, how they were constructed and the assumptions both in dating and in the relationship of the measured parameter (the ‘proxy’) to the actual data. Yes I am using the 57 stack of δ180 cores. I agree that the Ice core data has much more accurate and detailed time measurements. 2. Even if the absolute time scale is calibrated against the ice core it thyen extends backwards 5 million years. This is how we know 100,000y glaciations only began 800,000y ago. Why? The method finds the best result for age vs depth from that equation with penalties the more the age vs depth departs from linearity. We allow the nonlinearity b and mean time constant Tm of the ice model to increase with time due to the long-term increase in global ice volume. From 5.3–3.0 Ma, b is 0.3 and Tm is 5 kyr (M. Mudelsee, personal communication, 2004). Both increase linearly to 0.6 and 15 kyr, respectively, by 1.5 Ma and remain at those values to the present. The Pleistocene value of b is taken from Imbrie and Imbrie  while the time constant of 15 kyr is selected to maximize agreement with the independent age estimates used for the last 135 kyr of the stack. Ice sheet response time and the lag between insolative forcing and d18O are poorly constrained before 0.8 Ma. We assume that small ice sheets respond more quickly than the massive ones of the late Pleistocene and choose early Pliocene values of b and Tm to reflect the absence of large northern hemisphere ice sheets. I’m not claiming that this isn’t all justified, there is a substantial body of work, described in papers from the 1980s through to today to get to grips with. But it does help to understand that a set of cores which are best fit to rate of change of ice volume will correspond pretty well to rate of change of ice volume. This experimental calibration is interesting. I bet it could be updated, and updated in a way which would seem less ad hod. Stacked sedimentation rates provide additional age model constraints to prevent overtuning. If the variation in δ180 were random and not correlated in any way with insolation changes at high latitudes, no rational amount of tuning would give coherency over 5.3My. And sedimentation rate would seem to be a fairly strong constraint. I suspect that you will find that there has been at least some unstable isotope ratio dating of the cores as well. The U/Th ratio has been used for dating corals and foraminifera. It would be interesting to see if anyone has done testing with random time series to see if, like hockey sticks from red noise, you can find a signal that isn’t actually there. That’s not my hypothesis – no correlation of ice volume with insolation at high latitudes. I think I agree with your statement above. Anyway, I don’t have a specific hypothesis, more a number of them that need to be evaluated. One hypothesis is that insolation at high latitudes affects ice sheet growth but doesn’t start and end an ice age. If that hypothesis is true, then the ‘orbital tuning’ of proxy dates will obscure the actual causes and effects. A similar but different hypothesis is that low insolation at high latitudes starts an ice age and something completely different ends it. Verified dating of key transitions, not derived from assuming the Milankovitch hypothesis, is a necessary piece of the jigsaw puzzle. There is a fascinating paper to review soon which seems to so totally miss the point with the end of the last ice age and the orbital hypothesis that I wonder if I have missed something completely obvious. And there is another paper with a different approach that I am similarly amazed about. Once again I start to wonder if I am missing something so clear that was spelt out 30 years ago and of course no one bothers to repeat it. Then I remember that almost every paper I look at has a review which says that the actual cause and effect are still a bit of a mystery.. The two reasons you give for using the benthic aggregated data are completely valid. All of the available data needs to be used and your question is an important one. @DeWitt, I need more details before I have any idea of what I’m doing, but I was thinking of using a Bayesian approach, so the complete characterization of uncertainty should be captured in the posterior for each variable. For people interested, I downloaded the Excel file for NGRIP. The related paper is High-resolution record of Northern Hemisphere climate extending into the last interglacial period, North Greenland Ice Core Project members, Nature (2004). The file is in the Supplemental Info for the paper on the Nature website. Because WordPress doesn’t support “attached media” as Excel, I had to change the extension to .doc, so download, change it to a .xls and it should open fine in Excel. The website noted in the Excel file for updates didn’t work when I tried it, so I emailed the person listed in the file (one of the co-authors of the paper) in case there is any updated data. Hemisphere, but the oldest sections of the cores were disturbed in chronology owing to ice folding near the bedrock. Here we present an undisturbed climate record from a North Greenland ice core, which extends back to 123,000 years before the present, within the last interglacial period. The oxygen isotopes in the ice imply that climate was stable during the last interglacial period, with temperatures 5’C warmer than today. We find unexpectedly large temperature differences between our new record from northern Greenland and the undisturbed sections of the cores from central Greenland, suggesting that the extent of ice in the Northern Hemisphere modulated the latitudinal temperature gradients in Greenland. This record shows a slow decline in temperatures that marked the initiation of the last glacial period. Our record reveals a hitherto unrecognized warm period initiated by an abrupt climate warming about 115,000 years ago, before glacial conditions were fully developed. This event does not appear to have an immediate Antarctic counterpart, suggesting that the climate seesaw between the hemispheres (which dominated the last glacial period) was not operating at this time. thank you SoD, I looked for the Toba eruption from the Antarctica sulfate record some time ago, the spike was so large it muddled the record for a while. Here it could be partly responsible for the first deep plunge in the deepest glacial climate. I don’t easily get why there’s a spike after that, One could assume that it took 10000 years (70000-60000) to planet to get a grip after that, but this would mean the dating of the supereruption is a bit off. Then there’s the Oruanui eruption (commonly dated to 26500bp after which there’s also a gap in the spikes. Probably this is all well known in the geologist circles so I won’t speculate more.